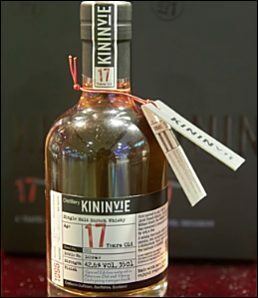 Kininvie 17 year old batch no.1 single malt Scotch whisky, distilled by William Grant & Sons in Dufftown, Speyside, has been released as a travel retail exclusive, launching first in Taiwan Taoyuan airport with Ever Rich Duty Free. The 17 Year Old travel retail exclusive follows the launch of the very first Kininvie whisky to be released – a 23 year old expression in the Taiwan domestic market. The whisky is presented in a 35cl bottle and makes the ideal gift for the discerning international traveller or the malt enthusiast. The company says that 80% of the whisky is matured in American oak barrels with the remaining 20% resting in sherry casks for 17 years. Kininvie 17 year old batch no. 1 has a classic Speyside character with a rich, fruity, floral aroma and an ABV of 42.6%. Every 35ml bottle highlights the year of distillation, batch number and has an individual bottle number. Ian Taylor, head of marketing for global travel retail at William Grant & Sons comments: “Kininvie is a truly remarkable whisky, and a great William Grant’s story. Only a family owned Scotch company could open a distillery and choose not to release any whisky for 23 years! A lot of people in the know have been asking us to release Kininvie for decades, but the family were not to be rushed. Last year a very limited release of only 7,000 bottles of 23 Year Old from 1990, the first year of distillation, was offered to malt enthusiasts in Taiwan and it created waves and disappeared off the shelves almost instantly. On the 4th July 1990 Janet Sheed Roberts, granddaughter of William Grant, formally opened the Kininvie Distillery. Kininvie has a classic Speyside character with a rich, fruity, floral aroma and taste sitting beautifully between the Glenfiddich and the Balvenie.